I have always had a thing for Russia, ever since I was young. It was always this very mysterious and far away place with exotic things like Cossacks, cathedrals and vast expanses of land. Oh, and vodka. 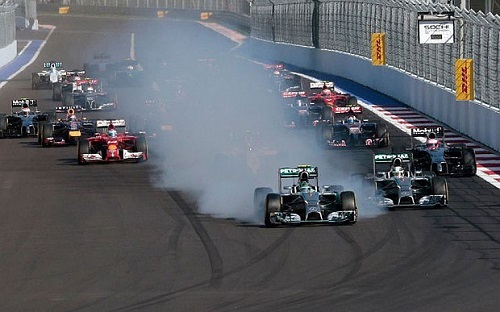 So in light of that, I was extremely excited to have an F1 race in Russia, and I had high hopes that it would be a cracker. Of course, Russia has not been the most reliable of friends, ruffling feathers here and there through land grabs, wars and interesting (questionable) tactics in politics, and there were many questions raised over whether F1 should have been racing in Russia in the first place – Mr E and Putin are good friends (obviously), and so the race not happening was never even in the equation. The race was also overshadowed by anxious thoughts on Jules and how he is progressing. Everyone wants news, and we want it to be positive, but for the moment I don’t think we’ll be hearing much more over the coming weeks unless something changes dramatically. 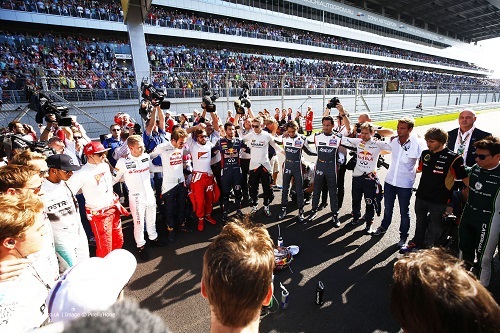 The show of solidarity performed by the drivers before the race was a nice touch, and showed just how much this tragedy is affecting everyone. Marussia chose to run only one car over the weekend in tribute to Jules, a gesture which was widely lauded. I was hoping the race would be a closely fought battle, with drivers coming to grips with the brand new track, the corners and all that fun stuff. It wasn’t. Not even close. 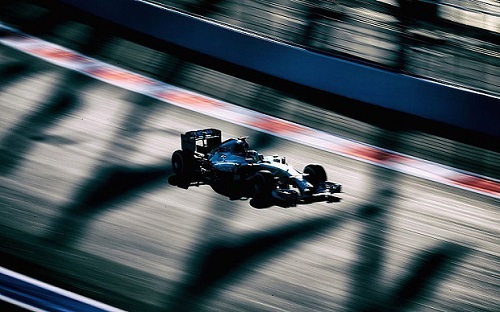 The start was mildly exciting with Rosberg locking up quite impressively into the first corner, but that was about it. He did manage an impressive 52 laps on one set of tyres, but not much else. Rosberg’s lock up meant that Hamilton was free to run away with the race, which he did quite easily, and he finished on the top step of the podium without any major hassles or worries. He is looking supreme at the moment, and unless something goes drastically wrong, I can’t see anyone else hassling him for the World Championship at the end of the season, adding to Mercedes new title of Constructor World Champions. Rosberg seems to have lost some of his fight lately, but I am sure that he will still bring the fight for the last few races, and will not let Hamilton run away with it. Valterri Bottas produced a very strong race yet again, and is rapidly claiming the title of a ‘Flying Fin’ away from Kimi. Ferrari had yet another dismal weekend, with Alonso’s problems being compounded by a slow stop, and Kimi just being slow. What Alonso does next year will be interesting, but I am still saddened that my ‘dream team’ failed so dismally. McLaren had a great weekend in contrast, finishing well in the points, and clearly aiming to catch Ferrari in the constructors stakes (and closing in faster than expected). Both Jenson and Kevin produced strong drives over the weekend, which has no doubt bolstered the confidence of the team heading into the last four races of the season. Sadly, that’s about it really from this weekend. The track didn’t really lend itself to super tight racing despite being super green, and there were some complaints made about the tyres chosen for the weekend. In some respects I feel sorry for Pirelli as it seems that they just can’t win this one. Some weekends the tyres are great, some are awful, there’s no real middle ground. It can’t be easy to be constantly being lambasted for performance when you have done everything you could. In summary, lets get to Austin and have a real race again.